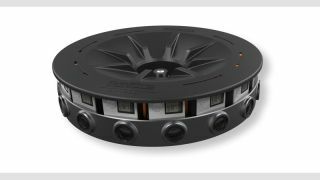 Remember GoPro's 3D, 360-degree video capturing rig that's made up of 16 GoPro cameras, the one that's designed to work with Google's VR platform Jump? Well, GoPro has today announced that the rig, which is called Odyssey, will be available for sale later this year - and will cost a hefty US$15,000. Unfortunately, GoPro says only "professional content creators and producers" can apply to purchase the rig right now, but with a $15,000 price-tag, it makes sense for the company to push it towards professionals at the moment. While the majority of us will miss out on buying the rig, this does mean that we'll be seeing more VR movies soon. And with the Odyssey rig using Google's Jump VR platform, the VR videos and movies will be made available on YouTube, which will be adding VR playback support soon. GoPro says the Odyssey offers 8K stereoscopic content capture for virtual reality at 30fps and includes multi-camera control and extended battery life. It's made up of 16 Hero4 Black cameras housed in a rugged case with syncing cables and custom software, and will come with the necessary cables, 16 microSD memory cards and a microphone. The company hasn't revealed yet if it or when it will be opening up sales of the rig for everyone. In the meantime, you could buy 16 GoPro cameras yourself and set up your own rig, and though it'll be cheaper, you will miss out on the syncing tech that GoPro says will come with the Odyssey. If you are a professional content creator, however, you can head on over to GoPro's site and register to purchase the Odyssey rig, which should begin shipping out later this year.